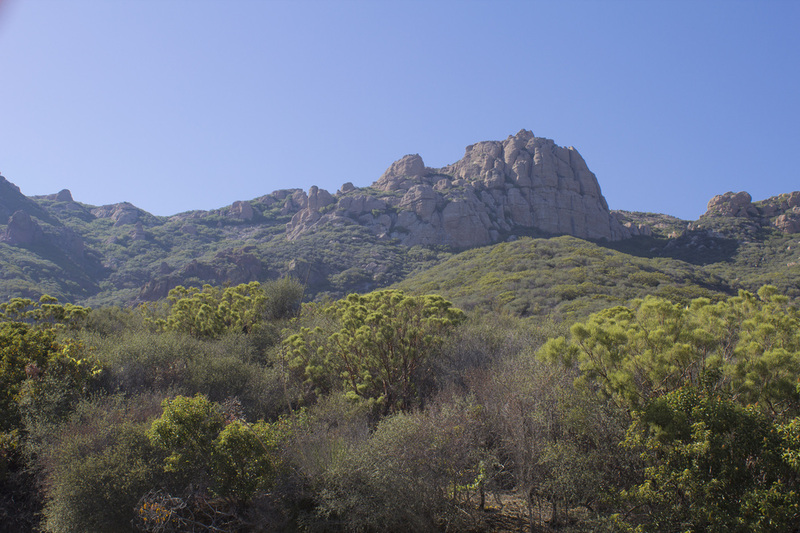 Explore all the recreational activities found in the Santa Monica Mountains Recreation Area with the National Park Service. What will you discover? 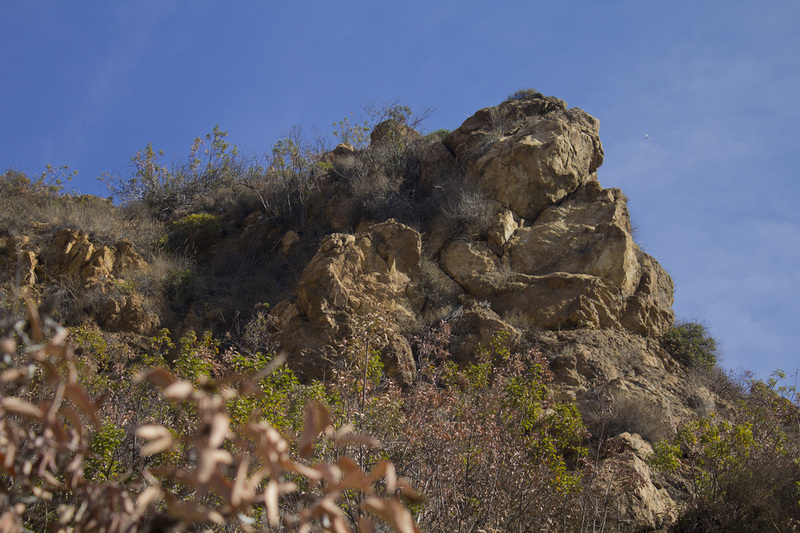 Built on a complex composition of sedimentary rock covering an area extending some 40 miles east to west, the Santa Monica Mountains are a transverse ridge of peaks and canyons situated along the coast of the Pacific Ocean. It is also home to the largest urban National Park in the US, the Santa Monica Mountain National Recreation Area. The area also includes a number of small state and local parks providing an incredibly diverse amount of outdoor experiences. Built on a complex composition of sedimentary rock, this andesitic range was formed by numerous episodes of uplift and submergence by the Raymond Fault, which runs beneath the range extending from beyond the Channel Islands in the Pacific all the way to the San Andreas Fault in the east. 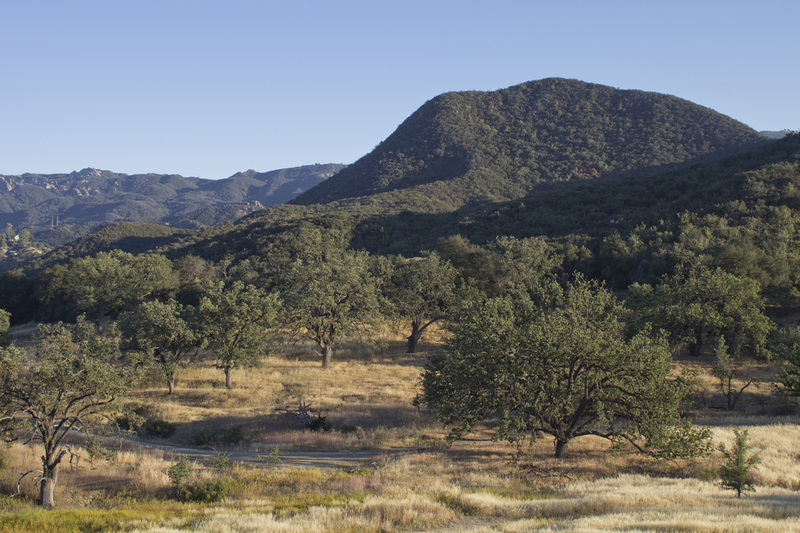 The Santa Monica Mountains are a very dry range, receiving only about 20" of rain each year. Due to their relatively low peaks, snow is seldom recorded here. As a result the creeks that drain the range often dry out during the summer and fall. When the rains do come, the range is home to a number of waterfalls with the Escondido Canyon Upper Falls considered one of the finer falls in southern California. Malibu Creek bisects the range and the southwestern headwaters of the Los Angeles River flow from the western end of the San Fernando Valley and along the north slopes of the Hollywood Hills and Griffith Park. The highest peak within the range is Boney Peak at 3,111'. The wildlife of the mountains is diverse, but several species are threatened or endangered including the Steelhead Trout. Of the areas native mountain lion population only 7 adult individuals are known to reside within the range. The biggest danger these large cats face are from automobiles crossing the range. The only venomous snake in the region is the Southern Pacific Rattlesnake. 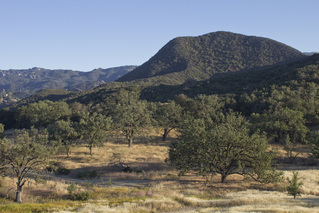 The mountain slopes are covered in California Chaparral and numerous oak woodlands. Creek beds throughout the area support a riparian environment of alder, willow and sycamore. Northern slopes also support the endemic California Black Walnut tree. 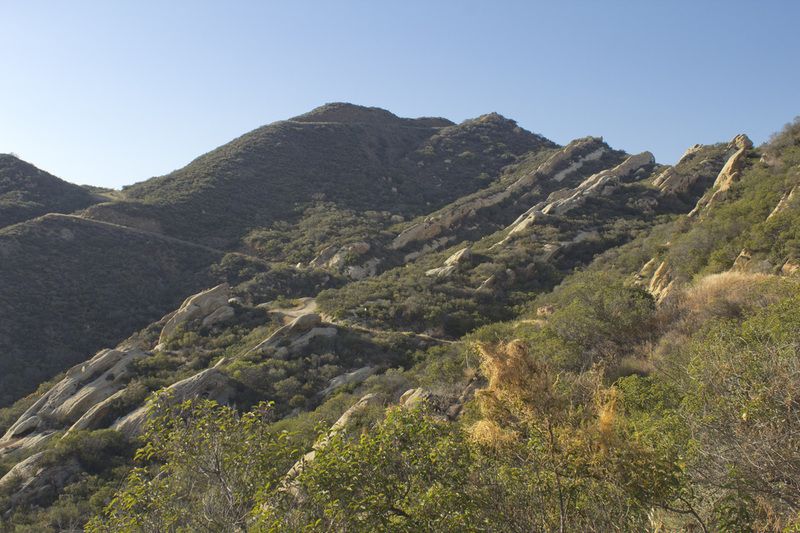 Through-hiking is available on the Backbone Trail, a 62-mile patchwork of trails that will eventually connect Point Mugu in the west to Will Rogers State Historic Park in the east. The trail crosses the spine of the ridge, dips down into oak woodlands and fords numerous creeks utilizing single-track use paths to groomed fire roads. When completed, the trail will cover 65 miles of urban wilderness, unifying all the parklands of the Santa Monica Mountains National Recreation Area. 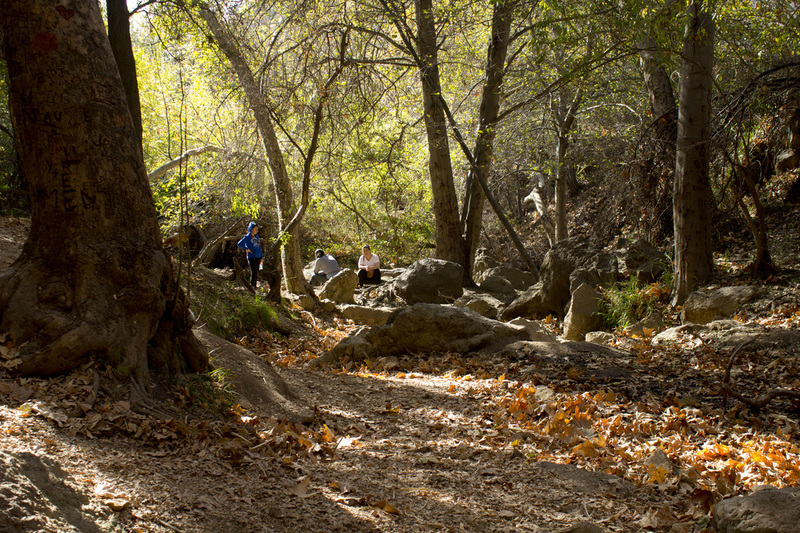 Escondido Canyon offers a gentle path through a riparian landscape of large oak trees and coastal sage scrub to a pair of seasonal waterfalls. The lower falls grotto is a lovely shaded spot with a fairy-tale like quality even when the water isn't flowing. A scramble to the upper falls has its own rewards as you wander through the dry creek bed to the tall rocky cliff with moss hanging like stalactites from the cascade's multiple tiers. 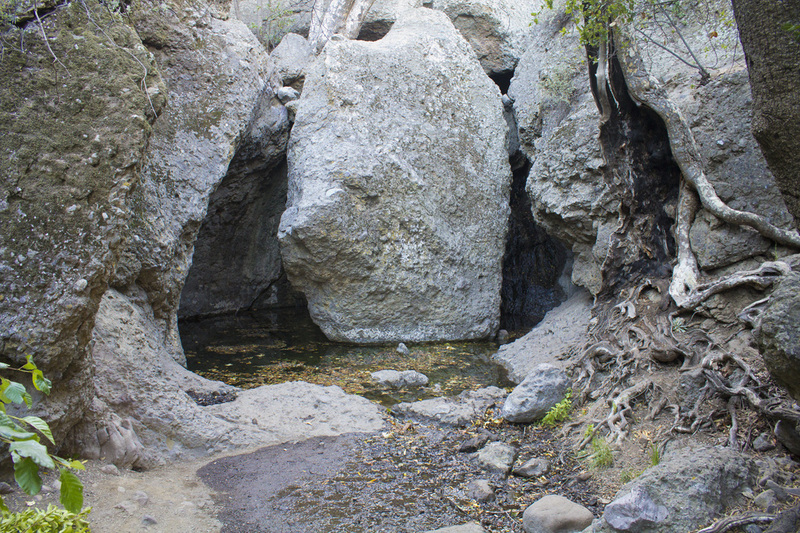 When the water flows, the upper falls are one of the finest waterfalls in southern California, but a hike through the close, tunnel-like underbrush of Escondido Canyon is always an adventure no matter what time of year you go. Located in Will Rogers State Historic Park, the Inspiration Point Trail is a short 2-mile hike on an easy grade, winding leisurely through 186 acres of park property. 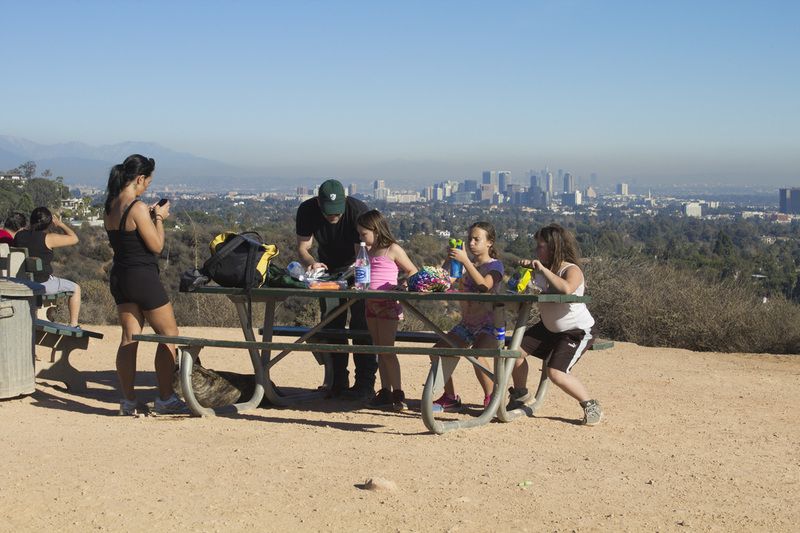 In fact, the trail only gains about 300' in elevation making it ideal for families with small children or folks who don't feel up for a pulse-pounding scramble up one of Los Angeles' more challenging trails. Along the way, hikers will be treated to fine views of the Los Angeles Basin, the Pacific Ocean and the Santa Monica Mountains. There is also the added attraction of taking a stroll through Will Rogers' historic ranch home or enjoying a barbecue while the kids play on one of the many activity fields. The Grotto is an almost otherworldly tumble of rocks and boulders that form a semi-circular cave at the lower end of a canyon below Sandstone Peak. During the rainy season, a small waterfall forms from the above creek bed and cascades down the inner recesses of the Grotto. The boulder field surrounding the Grotto provides plenty of opportunity to boulder and crawl around in unexplored spaces. Adventurous hikers can even make their way around the inside of the Grotto itself to get up close with the waterfall when it is flowing. Along the way, hiker's are treated to some fantastic landscapes of Sandstone Peak and the surrounding mountains plus some dizzying views down into the canyon. This loop hike to the top of the Santa Monica Mountains' highest summit, Sandstone Peak, incorporates both the Mishe Mokwa Trail and sections of the Backbone trail for a 6.25 mile trek through three distinct environments and interesting sandstone formations. The hike from Tri Peaks to the summit of Sandstone features several impressive overlooks and sweeping vistas across the canyons from the Pacific Ocean in the south all the way to the Sierra Madre Mountains in the north. The 360° views from the pinnacle of Sandstone Peak are nothing short of stunning. Sandstone Peak is part of the 5 Peaks, the tallest points in each of the 5 surrounding mountain ranges and is a must have summit for peakbaggers. This 2.5 mile loop trail takes you through 100 years of cinematic history with visits to an old western town, the plains of Africa, ancient China and a haunted wood. Over 150 movies and television series have been filmed here with Southern California filling in for locations from around the world. There's even remnants of an old race track, and it's all in our very own backyard. The trek meanders around the perimeter of the property, traversing dense chaparral and an open oak savanna with the majestic Sugar Loaf Peak rising above it all. If you're not up for the hike, horse rentals are also available. The National Park Service also conducts guided tours of the Old Western Town on weekends. This short, easy hike around a decommissioned reservoir in hills of Beverly is one Los Angeles' crown jewels. 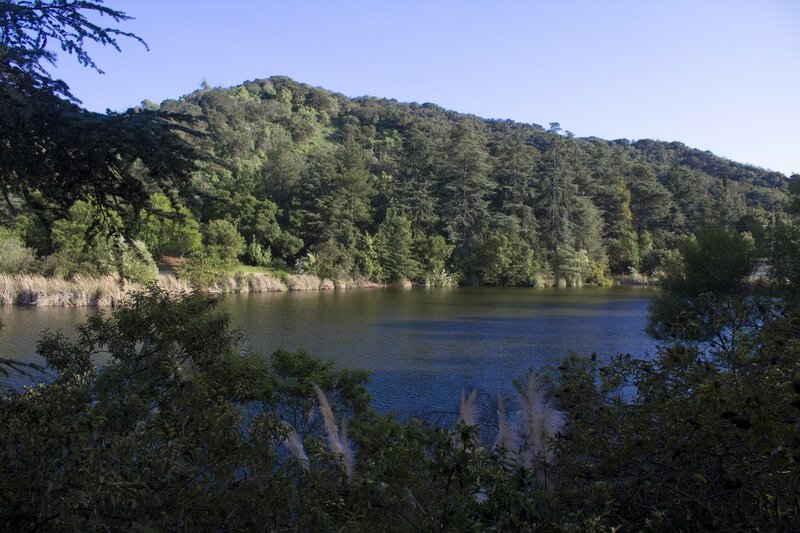 Situated on 605 acres of prime real estate, saved at the last minute from developers, this park offers a nature center, outdoor classroom and amphitheater, plus the beautiful Franklin Canyon Lake. Featured in movies and on television, most notably in the opening credits of The Andy Griffith Show where Opie throws a rock in the water, the lake feature a .6-mile trail around the perimeter of the lake that weaves in and out of a dense thicket of lush foliage, loops around a waterfowl habitat and crosses a small earthen dam. Parents with strollers can follow the same basic path around the lake on a level paved road.